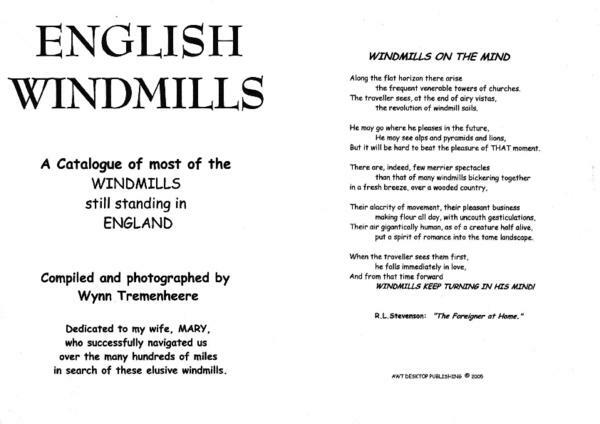 File TREM-EW - "English Windmills"
The book gives a photograph, brief description and condition report of 415 of the windmills still standing in England in the late 20th century. The information was collected over many years by Wynn Tremenheere and his wife Mary during their travels around England, starting in 1986. Some updating was done but mostly it gives the state of each windmill at the time of their visit. The book is dedicated to Mary Tremenheere (1926-2005). The book is held by Cranbrook Windmill Association at Union Mill Cranbrook where it is available for inspection.